This cat is cool yet intense. He may be all over the place — he lives in the moment, after all. When he figures out you’re worth it, he’ll boldly act to seal the deal. This type may not profess his love a lot, but if he’s fallen hard he will be unusually enthusiastic, and he’ll want to share his adventures with you — and that includes matrimony. This type values his independence. Just being with you exclusively demonstrates how serious he is about you. Your guy will be the cerebral type, analyzing everything, including your relationship. If he loves you enough to commit, you’ll won’t miss his sweet, affirming nature and loyalty. He might try to deny his feelings for fear of your rejection, so go out on a limb with this one: Tell him first how you feel! His easy-going, passive approach may cause you to question his commitment. Despite being late regularly or wearing a tough exterior, inside he’s a gentle artist who will soothe your soul when you’ve hit rough waters. If you’re able to draw him out of his shell, he’ll creatively show his love, writing you beautiful cards — maybe even painting a picture of you! The ISTJ man is loyal, dependable, and practical. His feelings run deep, even if he hasn’t expressed them to you yet. He may have already planned out your life together! If this is your guy, you know that he is a man of his word and you’ve experienced his dependability. He will be formal in his approach to courting you, always asking permission first and showing you every courtesy. If you catch him whispering with your parent, he may just be asking for your hand! The idealistic INFP will have an image in his head of the perfect girl to marry. He’ll carry around his shopping list in his mind until he finds “the one.” If you check all his boxes, he will open up to you in a way he can’t with others. His goals are harmony and connection, so you expect massive doses of encouragement and affection from this guy — and kissy face emojis! Lucky you: he’ll make you feel like you’re the only person in the world. Who wants a soulmate? The INFJ does! He’s looking for a love that’s deep and abiding; he wants someone to complete him. He might be a bit mysterious and withdrawn at first, but he’ll be devoted and all in with the right woman. If that’s you, you’re going to get eloquent poetry and handwritten cards — even breathtaking direct messages. He will thoughtfully implement his vision of your beautiful life together. If you’ve figured out your man’s type and his behavior’s a match, you can rest easy. Enjoy what you have together, and don’t second-guess it. If you’re still perplexed, be patient and invest in a little more observation. Of course, the only real way to find out is to ask him. Lisa Petsinis is a certified coach who works with resourceful individuals who want to beat overwhelm and let their brilliance shine. 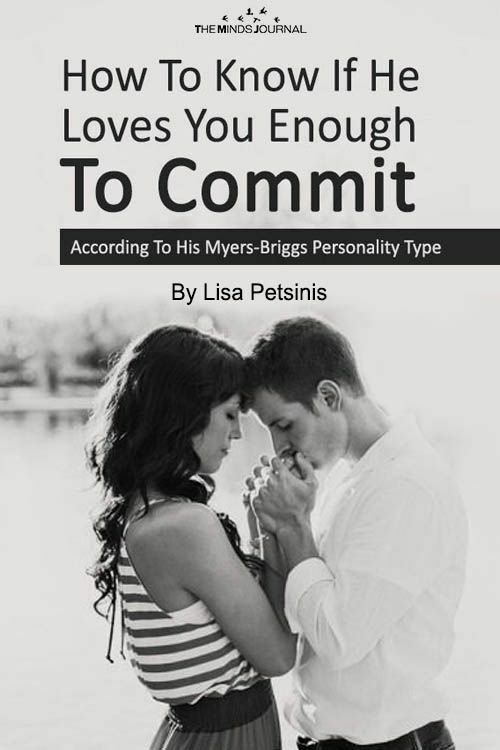 Contact her at www.lisapetsinis.com for a breakthrough call or sign up for her newsletter for even more advice. ESTP – Then I am screwed. Nothing like that!